We’re all familiar with CPU, GPU and memory overclocking, but over the last few years another PC component has been at the heart of a niche group of tweakers. It turns out that several very affordable Korean monitors are highly overclockable, with the ability to run refresh rates almost double that of their official standard. Asus has taken note of this trend, and has applied a factory overclock to its latest gaming display, the PG279Q. With an out-of-the-box refresh rate of a rather insane 165Hz, it’s the fastest gaming display ever officially sold at this speed. But how fast is too fast? The panel used within this display is actually designed to hit 144Hz, but enabling the overclock option via the OSD brings it all the way up to 165Hz. To be frank, even our discerning eyes couldn’t pick the 21Hz increase over the 144Hz standard, but for those who demand the fastest components around, the 165Hz refresh rate will be a big deal. We’re more impressed with the fact that Asus has squeezed this refresh rate out of an IPS display. Until recently 100Hz and above was the domain of TN panels, helping to compensate for their narrow viewing angles and weaker colour reproduction. Yet Asus has been leading the high-speed IPS charge for a while now, delivering all the benefits of these beautiful displays with the high frame rates that serious gamers crave. In case you’ve forgotten, IPS panels have a much wider viewing angle, at 178 degrees. This makes them especially good for larger displays like the 27 inches found here, as the edges of the screen don’t suffer from the colour and brightness bleed that big TN panels endure. They also have much more vivid and accurate colour reproduction. Throw in category-leading contrast performance, which gives the image much finer detail, especially in the shadows, and it’s obvious why IPS is now the display type of choice. If there’s one thing that isn’t so great about this display, it’s the native HD resolution of 2560 x 1440. At this size pixel structure still isn’t visible, but when compared to the new breed of Ultra HD, 4K and Retina displays that are doing the rounds, it’s a step backwards. The benefit is that you won’t need four Titan X graphics cards to power a 4K screen at 165Hz. A couple of GeForce GTX 980 Ti cards should do a very capable job. Asus has gone with Nvidia’s G-Sync technology on this display, tying its refresh rate to the framerate of the game you’re playing. This is still the superior adaptive sync technology of the moment when compared to FreeSync and Adaptive-Sync, though the latter are catching up. As such, you’ll need to pair this display with Nvidia GPUs to make the most of it. 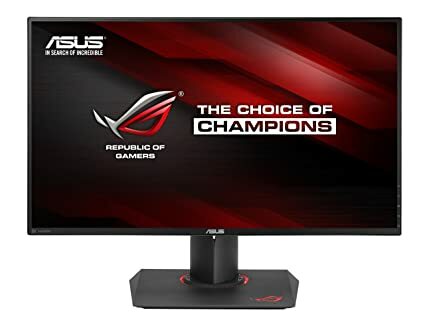 Even better, Asus has also delivered G-Sync in conjunction with its Trace Free technology, which is similar to the overdrive technology used on other high-speed displays. This removes any form of motion blur, delivering one of the most solid, smooth images we’ve seen on a display. There are a couple of niggles with this display though. First is the cost – at $1200 you can buy a decent entry-level projector for the same price, or a good quality 4K panel that is even bigger, albeit without adaptive sync technology. Secondly, with Intel recently announcing that it’s backing the Adaptive-Sync specification instead of G-Sync, Nvidia’s proprietary technology seems destined for obsolescence in the near-ish future. It’ll still be around for a few years at least though, hopefully, lest Nvidia upset the early adopters who have spent so much money on their tech. Finally, the displays onscreen framerate counter seems a little buggy – it only appears to show the framerate at the moment it’s turned on, and doesn’t seem to update as the framerate changes. It’s a minor issue though, especially as running FRAPS or Afterburner will deliver the same via software for free. If money is no obstacle and you’re looking for a screen that can keep up with your cybernetically enhanced eyeballs, there is no substitute – they just don’t make them faster than this. Add excellent image quality and blur-free gaming and you’ve got one of the finest gaming displays on the market.